On Wednesday, November 10th, Sights + Sounds will be released in San Francisco at NOMA Gallery. Five of the participating artists in the project will be performing including Tears, SCUBA, Collin McKelvey, Jesse Kauppila, and Holly Herndon. Little Paper Planes is producing a new publishing venture integrating the intentions of a gallery exhibition in conjunction with the zine culture. The LPP Exhibit Series is a non-traditional presentation of contemporary art functioning as a tangible form connected with a unified virtual aspect. The projects’ intent is to expand how we experience an exhibition through various media and mediums as well as assisting in the engagement and momentum of collecting art ephemera. "To Sober and Quiet the Mind" is a collection of John Cage's visual works he created with Crown Point Press in San Francisco over the course of his life. His philosophy on art was connected to and dependent on the everyday. Cage's interest lay in the nuances, interruptions, disruptions and subtleties of everyday life and sound naturally highlighted this temporality. Cage's work with sound, image and the everyday was preceded by artists in the Futurist and Dada movements, and his contemporaries in the Fluxus movement, who all employed a variety of media and performance styles. Their influences can be felt in contemporary music, theater, dance and art, and beyond. Sights and Sounds will take a close look at the relationship of visuals and sounds and how they inform or influence one another. When looking at Cage's visual work, I am immediately reminded of his sounds. The strokes dance on the paper as a non-linear score, creating a movement in a static image. The visual work acts as a bridge of pictorial information to an aural domain. With its layering of information and reconfiguration, sound can be similar to collage. The German artist Kurt Schwitters explored early installation and sound poems. Like the unpredictable image-scavenging of collage, many artists invent systems for themselves to work under. In 1975 musician Brian Eno, who trained as a visual artist, created instructional cards with painter Peter Schmidt called "Oblique Strategies." These cards acted as a conceptual construct to create solutions for problems while in the studio recording. This set of parameters to work under provided the appearance of logic even though it ultimately relied on chance. The visuals in turn assisted in developing an unexpected new language in sound. Utilizing both sound and visuals holds a tension between the ephemeral sound and the physical object, creating a dynamic relationship between these two sensibilities. Sights and Sounds will highlight the visual component, whether it be text or image, in the practice of artists who use sound. 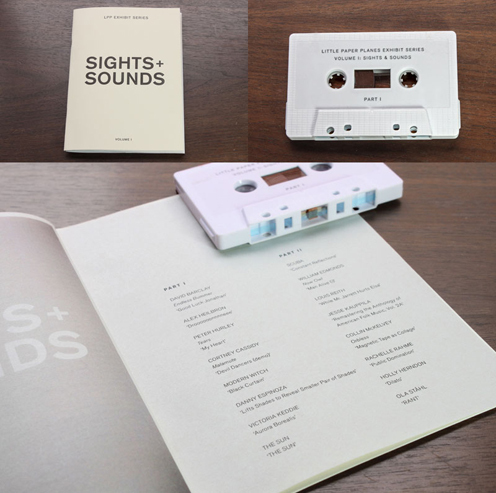 In addition to providing a piece for the visual exhibition in this booklet, the artist will also record a song or sound bite on a cassette tape. The booklet will be comprised of any visual aids either directly or conceptually connected with the sound pieces. The third part of the exhibition will have an online component. Our digital feed will give each artist an additional platform to expand their ideas in the immaterial form of the internet and present performances and installation shots.